Over the weekend Inhouse Pharmacy, the website most commonly used by trans* and intersex people in the UK to self-medicate, changed its ordering policies. 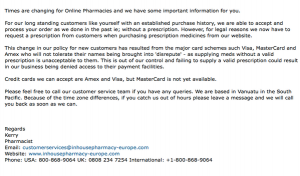 Whereas in the past the website has accepted orders for hormone replacement therapy medication (used by large numbers of older cisgender women in the UK and also by younger cisgender women as birth control), recent demands from credit card companies Amex, Visa and MasterCard caused the website to now demand a copy of a prescription before they will ship these medications. HRT is not a controlled substance in the UK. Ordering HRT from overseas websites without a prescription is not illegal in the UK. It is one of many “grey areas” in the medication field. However, credit card companies have been lobbied by the big American pharmaceutical companies to clamp down on orders filled without a prescription, even where it is legal to fill an order. As Lib Dem activist Zoë O’Connell noted on Twitter, “Visa and Mastercard are targeting Online Pharmacies due to lobbying from Drug Companies and BigPharma in the US”. This presents a massive problem for trans* and intersex people in the UK. While HRT is available on the NHS, many GPs shy away from prescribing it without the go-ahead of an endocrinologist or a psychiatrist specialising in gender identity problems (or both, in some extreme cases). The fact that both endocrinologists and suitably-qualified psychiatrists are thin on the ground in comparison to the number of trans* and intersex people needing their help means waiting lists are dangerously long. Hence the need to self-medicate in the interim, to combat the massive problems caused by a delay in treatment. For pre-operative trans* people, a lack of medication results in further damage to the body through incorrect hormones (further masculinisation or feminisation can cause irreperable damage and make transition far more difficult), stress and the various side-effects of depression brought on by Gender Identity Disorder. For post-operative trans* people, the best case scenario for a lack of regular HRT is osteoperosis. UK Trans* and intersex activists have flooded the Inhouse Pharmacy website with requests for clarification on their policies. Responses have been mixed, with some being told that orders to the UK do not require a prescription (although the box marked “I will fax a copy of my prescription” must still be ticked) while others have been told a prescription is required even for the UK. The fact that Inhouse Pharmacy has several different websites all run by the same company has not helped things. So far, the .biz version of the site appears to still be accepting orders without a prescription, while the .com site is hit-and-miss. T-Vox will continue to monitor the situation and report on any developments.